The Hawks 2008 season has gotten off to an eerily familiar start. At 1-2-2, with both overtime games resulting in a loss, it looks like the same old story in Chicago. Blown leads, crappy defense, and lackluster netminding through 5 games serve as a reminder to us fans the best days are now a distant image in the rearview mirror, and reality bites. Sources of optimism are few and far right now, but the young gun frontline mixed with enigmatic and wildly popular coach Denis Savard provides a glimmer of hope for the future. This glimmer faded away after only 4 games, when Hawks brass inexplicably announced that Deny was fired. The man who coined the phrase, “Commit to the Indian” apparently did not receive a requisite committment from the organization that he bled for. Savard’s replacement is Joel Quenneville, and he has some seriously big shoes to fill. 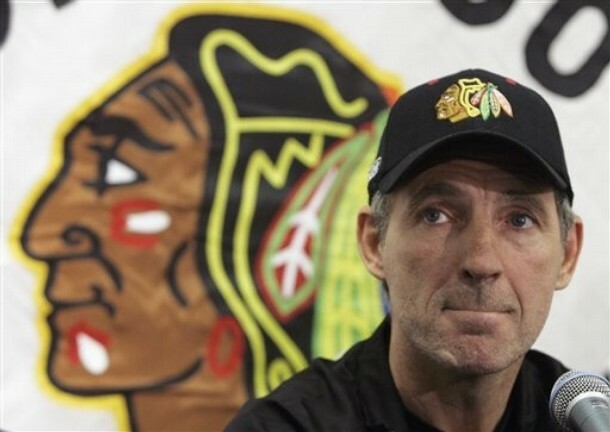 Denis Savard will always be remembered for his charisma, character, and loyalty. He put his heart and soul into the Blackhawk organization, and never openly criticized the team’s management as a player or coach, even when it was quite obvious the Wirtz family could give two shits about the city of Chicago, it’s fans, and the pride and tradition associated with being a Blackhawk. It’s quite ironic a team that has refused to commit to winning the last decade fired a coach for not doing it. Deny Savard is pure class, and perhaps this move is a good one after all. He is rightfully dissappointed, but maybe now he can find a niche in the hockey world where he will be treated with decency, respect, be appreciated, and submerged around likewise minds that care about playing the game right, developing young talent, forging strong relationships that last long after hockey is gone, and ultimately winning. Good luck in every endeavor that comes your way Mr. Savard, we will miss you dearly, unless you move north to Detroit.